A Golden Retriever was rescued from an icy pond in New Jersey. HOWELL, New Jersey -- A beloved family dog is safe and warm at home in New Jersey on Thursday night after he was rescued from a frigid pond. 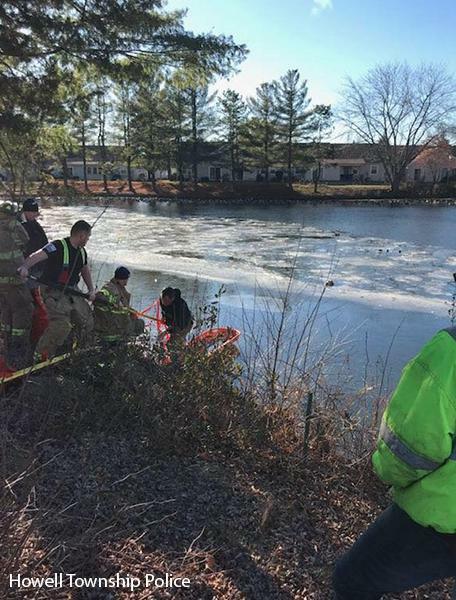 Duke, a nine-year-old Golden Retriever, was chasing geese around a pond in a housing development in Howell Township when he fell through the ice at around 1:30 p.m.
Howell Township Police and the Adelphia Fire Company quickly responded and went to work. As firefighter William Kruse was making his way across the ice to rescue Duke, he too fell through the ice, but not before he was able to grab the dog. They were soon pulled from the water by other first responders on the scene. Duke was quickly wrapped in warm towels and transported to a local veterinarian as a precaution, while Kruse was treated at the scene and released.